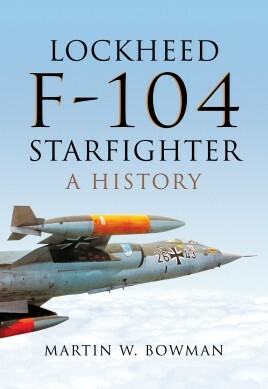 The F-104 Starfighter is quite possibly one of the most photographed aircraft of all time. It is certainly one of the most iconic. Here, Martin Bowman offers up a well researched, comprehensive and thoroughly entertaining history of this impressive interceptor aircraft and fighter bomber. Firsthand insights gathered from pilots who have flown the Starfighter in a variety of international contexts make for a rich and diverse narrative, interspersed throughout with a good selection of black and white and color illustrations that really bring the story to life. Over the course of an eventful history, the Starfighter has been caught up in an extensive variety of conflicts across the world. This book not only acquaints us with the landmark milestones of a widely utilized aircraft type, it also illuminates our understanding of the dynamic history of aviation in the second half of the twentieth century. Martin W. Bowman is one of Britain’s best-known aviation historians and authors. His previous books have included works such as Legend of the Lancaster, Confounding the Reich, Duxford and the Big Wings, Clash of Eagles, Lost Wings of World War I and numerous titles in the exhaustive Air War series providing extensive coverage of operations carried out on D-Day and during the Market-Garden offensive at Arnhem. He lives in Norwich.